My wife was helping her boss plan a Silicon Valley trip when she asked me if I knew the distance between Mountain View and San Francisco. Normally, I would have opened my laptop and checked Google Maps. Instead, I spoke — "Alexa?" — and then asked the question. Alexa, the brain inside the new Amazon Echo ($179.99) household assistant, let me know the distance was 33.5 miles. Well, thanks! That was easy. Unfortunately, Alexa couldn’t understand my follow-up question about the drive time between the two cities, despite my trying a series of different phrasings. Our experience illustrates the wonder and the frustration of Amazon's startling new household appliance. The Echo is essentially an Ultimate Ears Boom-shaped Bluetooth speaker equipped with a not-so-capable version of Apple's Siri (Alexa even sounds like Siri) for the same $180 as the Boom speaker alone. One cannot help but drool at the Echo's sheer potential while remaining simultaneously chagrined at her current limitations. 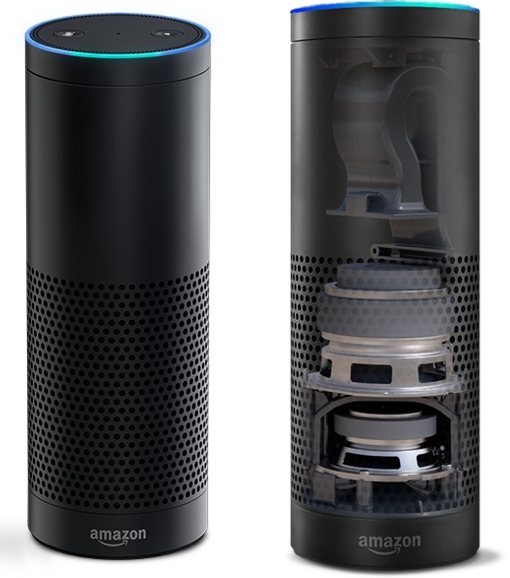 While Echo is the name of the cylindrical device itself, Alexa is the name of the smart cloud-based software that wakes up when you call her name to answer your questions. Amazon has such high hopes for Alexa's smarts and voice capabilities that it is opening up both for product makers to integrate into their products. For instance, smart home platform developer Wink is planning to include Alexa voice command capabilities into its system and Wink-enabled smart home products. The cylindrical black Echo measures 9.25 inch x 3.27 inches and 1.7-pounds. It runs on AC from your wall; there's no internal battery, so it isn't portable. The Echo generates sound via a mono up-firing 2-inch tweeter, a 2.5-inch woofer and a reflex port to enhance bass without distortion. Its largely superfluous remote control is identical to the one that comes with the Amazon Fire TV. Of the controls on top of the Echo —an action button that activates Alexa, an LED light ring that shows the device’s listening or action status, a seven-microphone array around its rim, and a microphone off button — you're likely to use only the microphone control. You’ll set up and customize your Echo with the Echo app available for both Apple iOS and Android devices. The Echo is naturally also compatible with Amazon's own Fire OS. 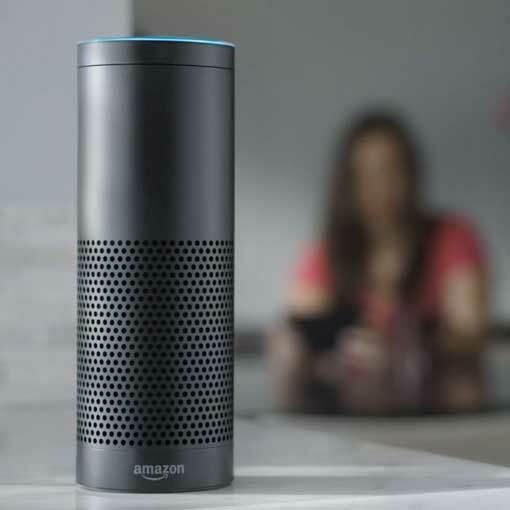 Use the app to set up Echo's connection to your home a/b/g/n Wi-Fi network; tell Alexa where you live so she knows what news, weather and traffic updates to deliver; sign in to available streaming music services (including Amazon Prime Music , Pandora, iHeart Radio and TuneIn, so far); set up Amazon voice shopping; sync with your Google Calendar (sorry, Apple users — no syncing with Mac OS X or iOS Calendar) to ask for your schedule; and sync with any connected smart home products you have that Alexa can voice control. You can place Echo nearly anywhere in a room. A central location away from a wall is best. Alexa can hear you from nearly anywhere in a normal-sized room, even above the cacophony of TV noise or conversation. If she can't — and I encountered a couple of incidents where she misheard me or even woke up based on extraneous TV conversation (which, as far as I can tell, did not contain the word "Alexa") — you can use the microphone in the remote to communicate with her. What can (and can't) the Echo do? Once you've connected the Echo to your home Wi-Fi, just say "Alexa" (or if someone in your home is already named Alexa, you can change the wake word to "Amazon"), wait for the blue LED ring to light up and then enunciate your query or command. No, the Echo isn't always listening and recording what you say — although I can imagine a future where it could be set to do so, nanny-cam style. Alexa listens only for her name to wake her up. But Alexa can learn. Alexa’s app includes a short voice training session to help her understand you better. And instead of listening to everything you ask, the app lists everything you ask. Then you go through your interactions and answer "Did Echo hear you correctly?" for each, so Alexa gets to know your voice better. You can ask Alexa what the time and date is or what the weather is or will be, set a timer or alarm (just a buzzer) with snooze, ask simple, single-fact questions like my mileage query, convert weights and measures ("How many teaspoons in a cup? "), define a word or even tell you a joke. More complicated questions, such as my driving distance query, confounded Alexa. On my iPhone, however, Siri immediately switched to Apple Maps and outlined both 58- and a 53-minute driving routes. Alexa couldn't tell me the plot of "The Group" by Mary McCarthy, the name of Jake Gyllenhaal's character in "October Sky," where the Yankees were playing that evening (only the score) or on which Hawaiian island Barack Obama was born. In most of these cases, Siri directed me to an online source for the answer (although she couldn't tell me about "The Group," either; she kept looking for Mary McCarthy in my contacts). In contrast, Alexa is limited by only being able to vocalize, rather than display, her responses. The Echo paired via Bluetooth to your smartphone or tablet becomes a Bluetooth speaker; with sound not as fulsome as the UI Boom but still impressive, considering the Echo was primarily designed for a radically different purpose. You can ask the Echo to play music from a specific artist or a playlist pulled via Wi-Fi from your Amazon music library (not your smartphone's library) or one of the aforementioned streaming services, identify a song currently playing, stream a specific Internet radio station, read one of your Audible audio books or give you a customized news report (what Amazon calls a Flash Briefing) based on topics and sources you select. You can use voice commands to control Echo's volume ("Alexa, volume 8! "), mute, repeat, cancel and stop. Alexa lets you shop on Amazon. Just enter your Amazon account name and password in the app's settings, along with a PIN. You can buy new music and products you've already bought from Amazon and add items to your Amazon shopping list. All I had to do was name the item and tell Alexa my PIN when prompted. She then told me the total cost of my order and expected delivery date. Voice ordering was so stupidly simple, speedy and painless that it could become dangerously addictive. Showing perhaps its most promising potential, Echo can find and enable Alexa voice command for your smart home products. Initially, only the Belkin WeMo and Philips Hue smart home lighting products are supported (and I don't have any of these products, so I could not test this feature), but it's likely other smart home products and platforms will be added over time. Even though Alexa, like Siri, has to connect to the cloud before answering or acting, she responds nearly instantaneously. Thanks to her uniqueness, she is really cool to use. If the Echo seems limited at the moment, it's easy to see what it could become once third-party app developers and product makers — or even you, if you have any skill or interest in programming —get their hands on her ample APIs (application programming interface), which Amazon is offering for free. In fact, Amazon's Alexa Fund contains $100 million to support developers, manufacturers and start-ups of any size to develop Alexa voice-centric functions and products. The Echo is like a newborn baby with much to learn but as yet little more than a cute plaything. Like a baby, Echo is also annoyingly anchored; if it could run on batteries, I could move it from room to room when necessary. But like all precocious prodigies, the Echo holds an unknown but portentous future. It will be fun to watch its potential grow, perhaps even into an indispensable member of your household. I already want another Echo for my bedroom.